Crisis, Crisis, Crisis… We hear this since 2008. It is now 8 years that China is not delivering the growth it was expected, that European countries are struggling with economic development and that the US has up and downs. India and Brazil? Indian poor distribution and Brazilian importation high taxes kills it. Nevertheless, the Swiss watch industry has never been better. Exports are currently at CHF 22billion, which is more than twice as we used to have back in 2008. Naturally some brands have had some challenges but which industry does not? This health did not happen by miracle or by chance. It happened because Swiss watchmakers dare to change, to adapt and above all to blow your mind with true amazing ingenuity. This year, more than never, Swiss watch makers decided to stand up in front of the crisis colossus and say enough of this negative situation. All Swiss watch brands decided to keep moving forward with innovation and to remind buyers why they love so much Swiss watches. The situation is pretty clear. In the world, 90% of total watch production (all segments united) comes from Asia, Hong-Kong being the big hub. 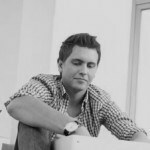 If we get interested now only on the segment of $ 1’000 and more, then 90% of the world production is done in Switzerland. Here is the true power of Swiss brands. They have a higher end approach and provide you much more than just giving you an accurate time (which by the way your microwave can do). Swiss watch brands will gather and celebrate hundreds of years of know-how and innovation. They also have the trust of their customers as many of the brands have been around for more than 100 years and probably might be around for another century. If we would summarize what happened this year during the 2 main watch trade-shows in watchmaking, SIHH and Baselworld, we can say that Swiss watch brands stood for innovation, differentiation and know how. While many brands are driving the cheap and safe route of mediocrity, Swiss watchmakers want to shine bright in the sky. In January, the SIHH brand exhibitors wanted to bring a strong statement about what they stand for. So several watch brands decided to highlight their iconic watches in order to remind the strong difference between standardization and unique craftsmanship. Here are the highlights of this year’s SIHH. 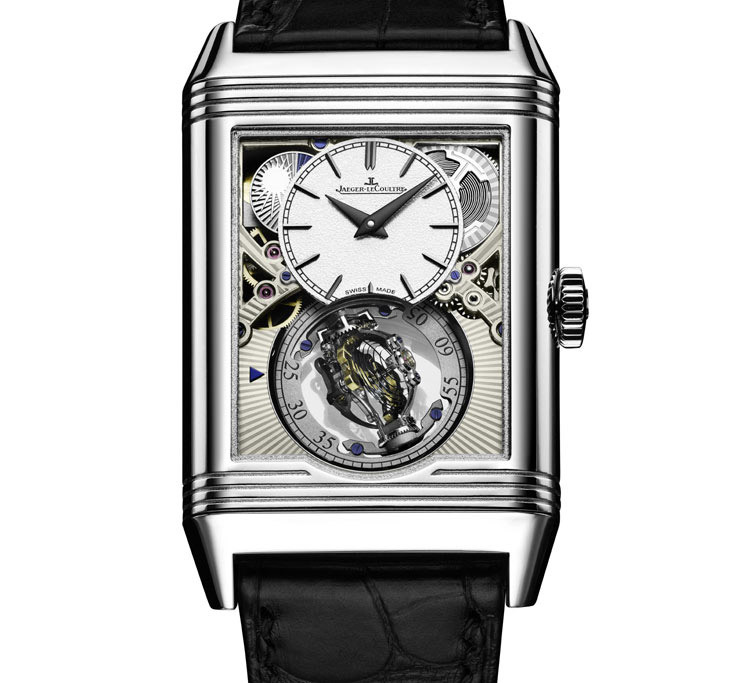 Jaeger LeCoultre, the 85th anniversary of the iconic Reverso. When Jaeger LeCoultre (JLC) decided to celebrate the creation 85 years ago of one of the most recognizable and innovative watches of the swiss industry, they wanted to bring a strong statement. By launching a new collection called Reverso One, the message was clear in terms of innovation, design and ingenuity. They also had a series called Reverso Tribute, inspired from the historical models of the iconic range. The cherish on the cake is the Reverso Tribute ©Gyrotourbillon. This watch is fully produced within JLC manufacture and possesses an amazing JLC caliber 179, fully built in-house and showcasing a spectacular Gyrotourbillon® that gives you the impression of floating in the airs thanks to a clever external mechanism. IWC, watch-making for aviators and pilots since 1930. Last year, IWC launched a celebration around its iconic watch, the Portugieser. This time, the Schauffausen watch maker is revisiting its aviators watches. 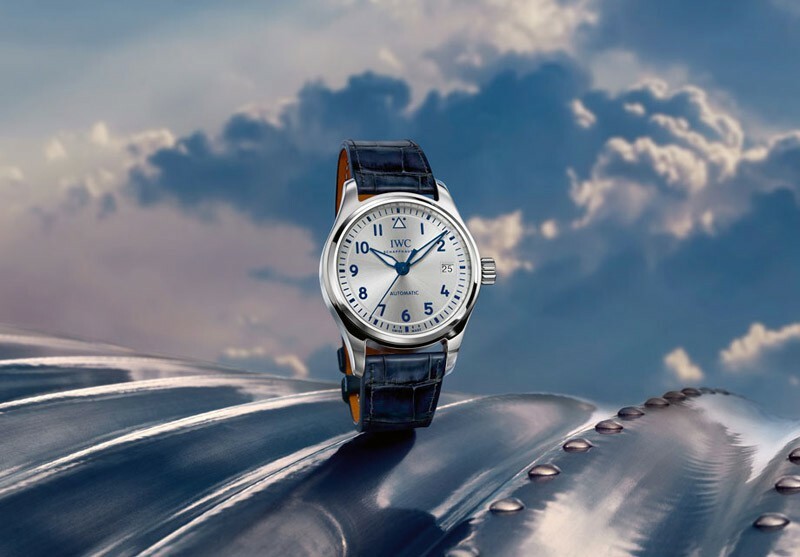 Initially created in the 30’s, today IWC proposes a contemporary vision of the elegant sky adventurer. We would highlight the Timezoner Chronograph in which you can easily adapt the Timezone by turning the watch bezel. Another beautiful watch is the “Petit Prince”. IWC completely capitalizes on its heritage and know how. 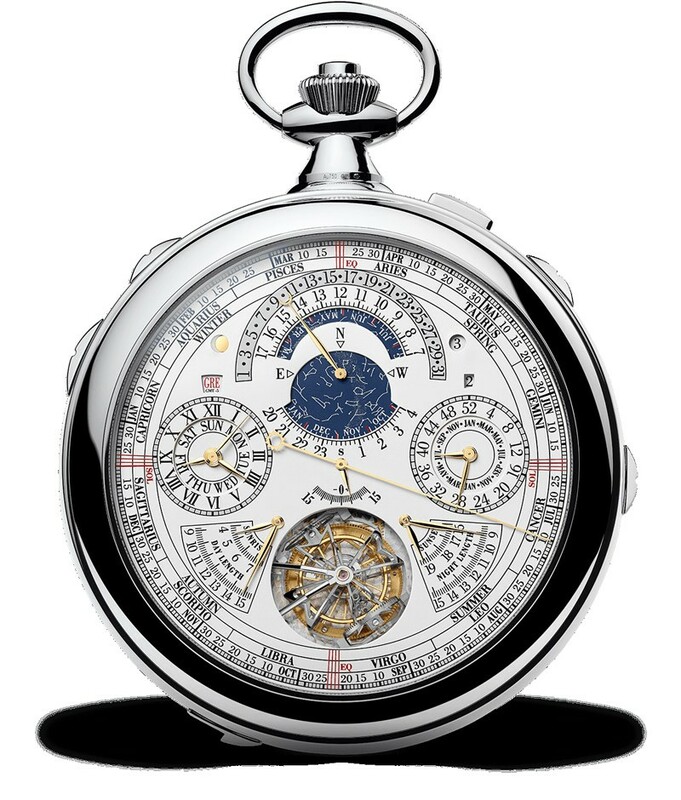 Vacheron Constantin is a true master in high end complications. Its know-how since 1755, provides the Geneva watchmaker with a wide range of techniques. 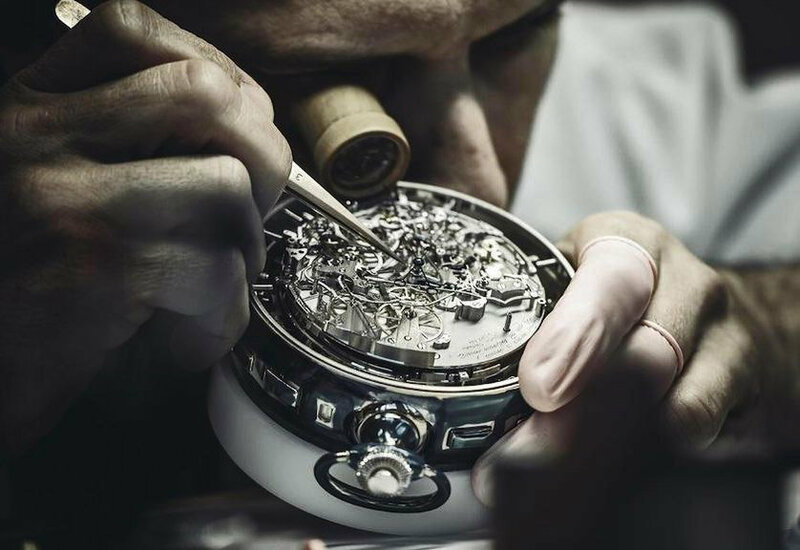 Each Vacheron Constantin is a state of the art watch. This year they challenged the internal teams to come up with an amazing pocket watch containing 57 functionalities. It is a true world record. Under the reference of 57260, this amazing watch celebrates the company 260 years of continuous history. Never a pocket watch had so many functionalities. Cartier is the crown jewel of SIHH. By blending watchmaking and jewelry, Cartier proposes a poetic, astonishing collection of high end watches that only Cartier has the secret to make such outstanding pieces. This year, Cartier capitalized once more on its amazing in-house métiers d’art. 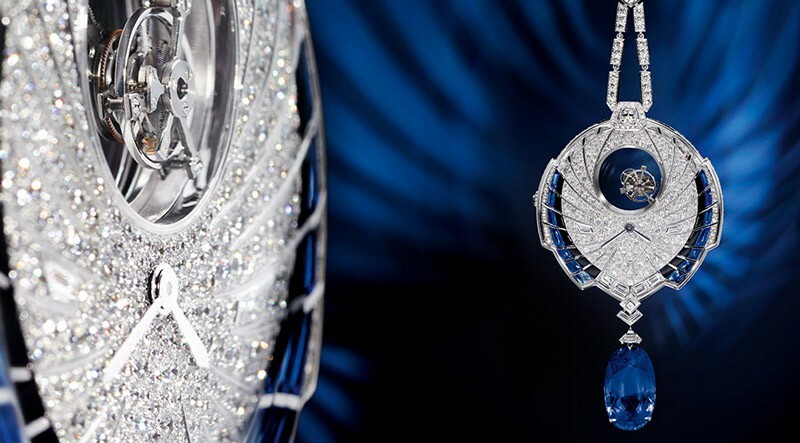 One of the master pieces of the SIHH was the Mysterious Tourbillon Azuré pendant. This amazing piece displays an incredible 26 carats blue sapphire and from a watchmaking point of view the double mysterious tourbillon is a killer! The Cartier caliber 9463 expresses a majestic swiss precision wrapped with a beautiful piece. The SIHH ended in a very positive note and all brands involved had a confident vision of 2016 as another great year for Swiss watchmaking. As the watch fair happens in January, we usually tend to analyse the projections in order to “take the temperature” of what is going to happen during the year. It will help us to wait until Baselworld to happen end of March. 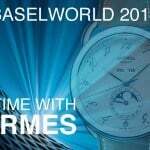 Last month, Baselworld has also made the buzz and several watch brands decided to step in and say that economic crisis is not a fate and that we can get around of it (clock-wise please). The leading brands put aside the strong Swiss franc, the Chinese crisis and other challenges in order to focus on what they know to do best: innovate with a clever Swiss ingenuity. So here are the top highlights of this year edition, most of them became worldwide buzzes. 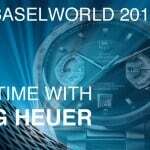 We could not start a final review of Baselworld without talking about the Tag Heuer Carrera Heuer 02T and its Tourbillon for less than CHF 15’000. The new watch was a true technical challenge for Tag Heuer and definitely made the buzz. Just six months after the release of the TAG Heuer Carrera Heuer-01- the backbone of a new collection of elegant and contemporary manufacture chronographs- comes the TAG Heuer Carrera Heuer-02T, a COSC-certified automatic chronograph combined with a titanium and carbon flying tourbillon. A symbol of the accessible luxury so dear to TAG Heuer, this model forms part of a new concept now being created: affordable Haute Horlogerie. This watch symbolises technology, exemplary quality, performance, manufacture expertise, and the perfect mastery of industrial processes and manufacturing costs which have made it the only COSC automatic chronograph with Tourbillon produced by the Swiss watch industry for under 15,000 CHF. The Black Phantom version priced at 19,900 CHF, is part of a limited edition of 250 numbered pieces. 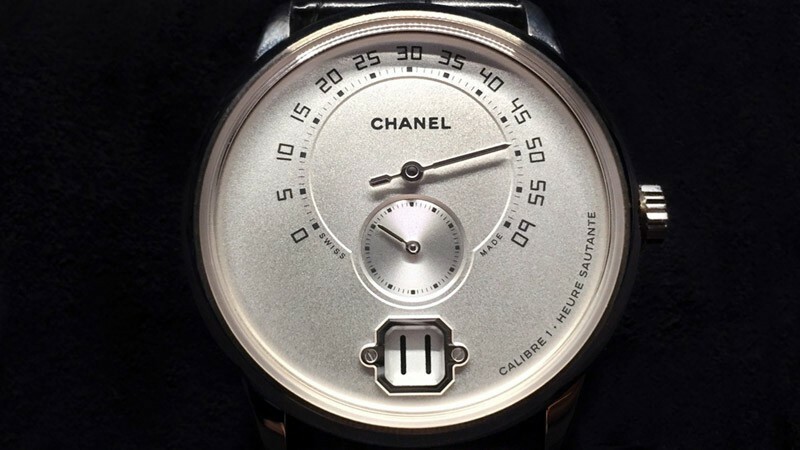 This year at Baselworld, Chanel made the luxury news headlines by launching MONSIEUR, a true watch for men. Despite the fact Chanel is a big company, the spirit of the new watch is more a “esprit manufacture”, meaning on the same spirit as independent watchmakers. The entire watch is manufactured in-house. Naturally Chanel will continue to collaborate with other watch prestigious houses on the regular watch lines. By keeping the MONSIEUR limited, it will please collectors and Chanel aficionados. Only 300 pieces will be produced, White Gold and Beige Gold. The recommended retail price is between €31’500 and €33’000. With the launch of MONSIEUR, Chanel brought a special wind to Baselworld. Chanel is always a quite discreet brand that do not search for an outrageous buzz every time they have a product launch. This time the project was too big to get under the radar. With this new watch, Chanel brings a strong statement in watchmaking. The French luxury brand is launching a beautiful timepiece in the great tradition of watch-making. The men’s segment is the keystone of the watch market and the watch itself is showcasing the best Chanel can do thanks to the dedicated and expert in-house teams they have in La Chaux-de-Fond. This is the new CHARMING BIRD by Jaquet Droz. This new watch has a hand-engraved and hand-painted white mother-of-pearl dial. You can see as well an Onyx subdial. 18-carat red gold case and applied ring. Singing bird automaton movement, hand-winding mechanical movement and push-button automaton triggering mechanism. Sapphire whistle system. Hours and minutes self-winding movement. Power reserve of 38 hours. Diameter 47 mm. Numerus Clausus of 8. AUTOMATON Singing bird automaton movement, hand-winding mechanical movement and push-button automaton triggering mechanism. Sapphire whistle system. Hand-engraved platinum. 10 years later, Hublot celebrates the birth of a trend by launching a 500 units All Black Sapphire watch. Naturally in order to respect the concept of All Black, Hublot has developed a “smoked Sapphire”. And here is the new model, purely an amazing design. 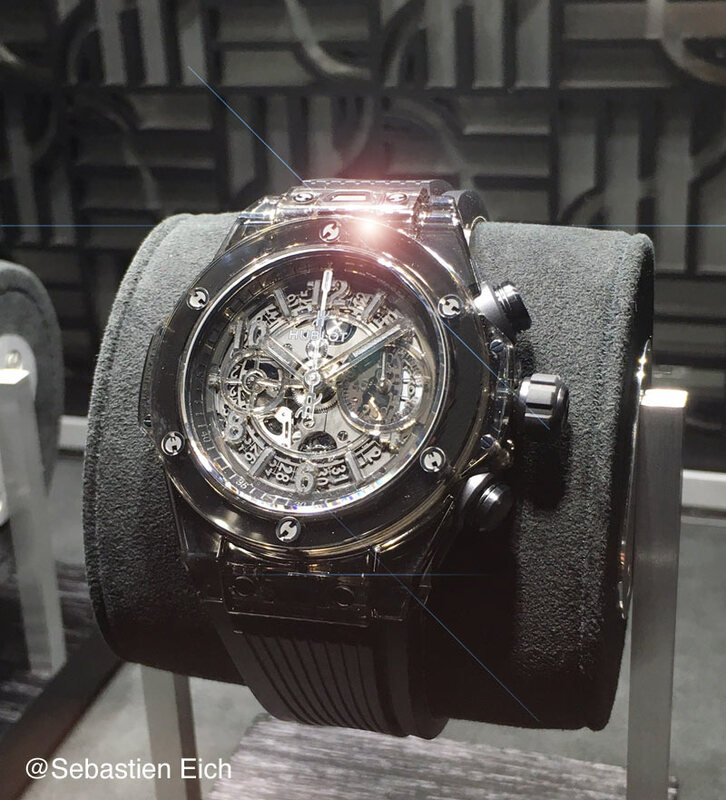 Again, Hublot worked on a fusion of materials in order to bring a contemporary look to this new watch. The smoked effect is astonishing, bringing an interesting depth to the piece. It also procures a more lower profile than a full transparent sapphire. As we can see, the Swiss watch industry has a strong answer to economic crisis. It is called innovation, daring and true respect of traditions. 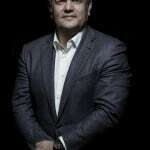 Info sourced at official press releases, Forbes, wikipedia, the Swiss watch making Federation. All content is copyrighted with no reproduction rights available. Images are for illustration purposes only.